When two automakers compete in the minivan segment things can surprisingly get awesome. Supercars compete by trying to out lap one another on the race track and by making said lap much more fun than its rival's. But on the minivan side of the industry, the challenge is won by whichever automaker can best mimic the interior of the American living room. The current Chrysler Pacifica and its myriad of features does a good job of that, but the Honda Odyssey was Japan’s first volley at the American/Italian automaker’s near monopoly on the segment, and it has just struck again. The 2017 Detroit Auto Show has seen some impressive reveals. Most seem to be family crossovers aimed at offering minivan capability in the body of an SUV. 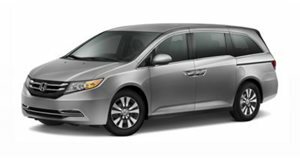 For those who want an actual minivan, the Odyssey refuses to be the model passed over in dealership lots. "In all aspects of its design, the new Odyssey is made to keep every member of the family happy,” says John Mendel, executive vice president of American Honda. Proof of this philosophy is found in the suite of vehicle connectivity apps, which include CabinWatch, an app that allows the driver and front passenger to keep tabs on the rear seat occupants using a camera, and CabinTalk, which lets the driver speak to second and third row passengers using speakers and infotainment headphones. A rear seat infotainment system that uses a 10.2” display mounted on the ceiling to play movies and even includes a “How Much Farther App” that prevents kids from asking the age old road trip question, “Are we there yet?” Another app called CabinControl allows smartphones to control vehicle settings such as the rear seat infotainment and climate control systems while Social Play list democratizes the music choices within the car by allowing each of the eight seats to chose a song via smartphone. Ownership is no last-minute thought either, with leather seating surfaces designed to prevent staining and seatbelts colored in black to hide stains. Kids. Stain. Everything. Magic Slide seats works beautifully for versatility by allowing easy movement for comfortable seating, fast folding for cargo carrying, and easy access to the third row by varying the position of the second row seats through five different modes. These enable anything from moving the middle section of the second row to slide forward so that front seat occupants can easily reach a child seat in the back to removal of the middle seat to allow for the rear area to become two captain's chairs. Drivers with a need for speed will love the 280 horsepower made by the 3.5-liter V6 engine and routed through either a nine-speed automatic transmission or a new 10-speed. It's no quarter-mile killer but it could be worse, right? High-strength steel, aluminum, and magnesium permeate the bones of the Odyssey, stiffening the structure by 44% over the outgoing model, reducing noise and vibration. The improved structure cuts weight down by 96 pounds in its lightest configuration. Keeping the whole family safe on the freeway is Honda Sensing, the automaker’s package deal of driver aids, a feature that Honda expects will be optioned in 95% of Odysseys. Complimenting this is intelligent traction control helps keep the vehicle under control in all weather situations and adding another layer of safety for the precious cargo in the rear. The Odyssey goes on sale in late 2017 to make road trip headaches a thing of the past.